Well, we did it. I managed to waddle around the PNE for our annual family tradition of attending Vancity Members Day. At 38 weeks & 4 days pregnant, this was quite a feat. The weather wasn't ideal, but we had fun. There are LOTS of benches to sit on everywhere & we sort of planned things so I could sit & relax in between short bursts of walking. The PNE has got some great amenities for parents of babies & toddlers. Notably, the baby zone, a couple of portables where you can change babies, warm bottles & breastfeed on a couch in a separate room if you're not comfortable doing it al fresco. There are extra washrooms near the kiddie rides area too which are not that busy. 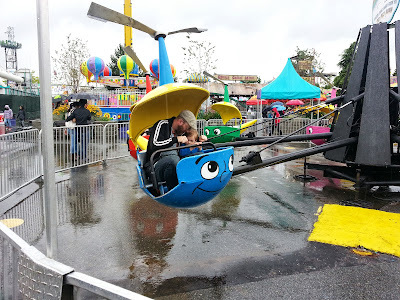 The helicopter rides are a good bang for your buck with really small kids (even under 36"). Just two tickets gets your kid in & a parent/caregiver gets to ride for free. Ask for the list of rides that allow parents on for free at the booths in Kids Playce where you buy tickets. 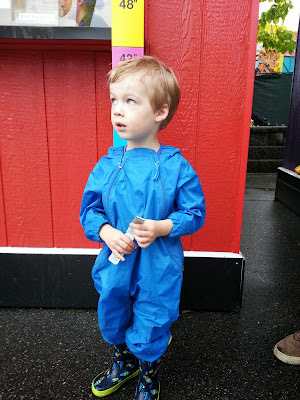 Over 36": tall enough for lots of rides! There are quite a few water fountains around, so keep hydrated in the lion's jaws or bring your own bottle to refill. The cheapest cold drinks we saw were $3.75! 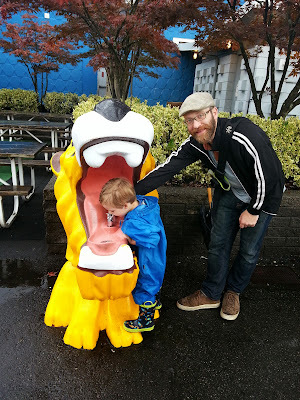 Drinking water from the jaws of a lion? Why not? The best deal on fried snacks is pakoras at Curry in a Hurry: $3 a plate. Everything else is quite expensive. 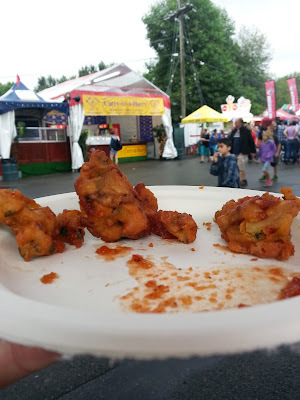 Bonus: pakoras actually have vegetables in them! 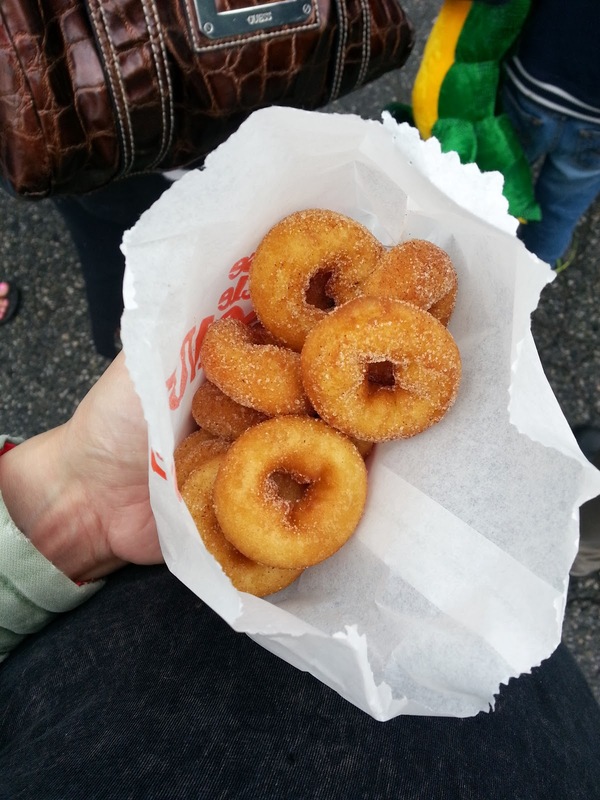 If there are big line-ups, keep walking into the park: the third or fourth mini-donut stand won't be as busy. I can't resist these & make a beeline for them immediately upon arrival. Cloudy/showery days are much less busy if you don't mind getting slightly damp. 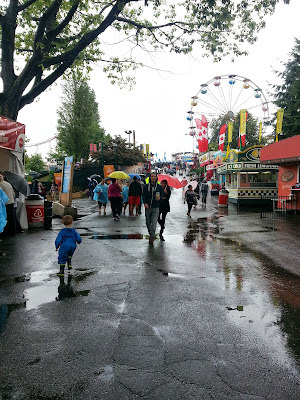 Putting the kids in muddy buddies & gumboots mean no wet pants from benches/rides or puddles. He might have had more fun in the puddles than one ride he tried. 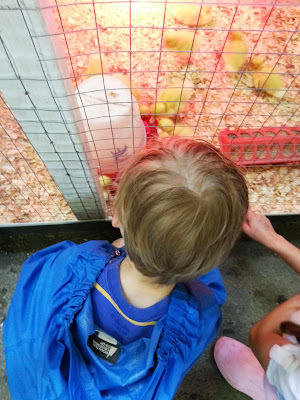 Check the live show schedule at beginning of your visit, or better yet online before going--we saw a farrier shoeing a police horse & caught a bit of a kids' stage show but missed out on Superdogs & the pig races as we didn't plan ahead. For our little urban boy, looking at all the animals is always a highlight of the Fair. It was also a great place to get out of the rain & sit for a bit--there are benches everywhere in there, great for resting while pregnant or breastfeeding. The food prices really are out of control. The prize pack I won (thanks again! :D ) has a coupon book, and one is for a donair plate and pop - "only $17!" 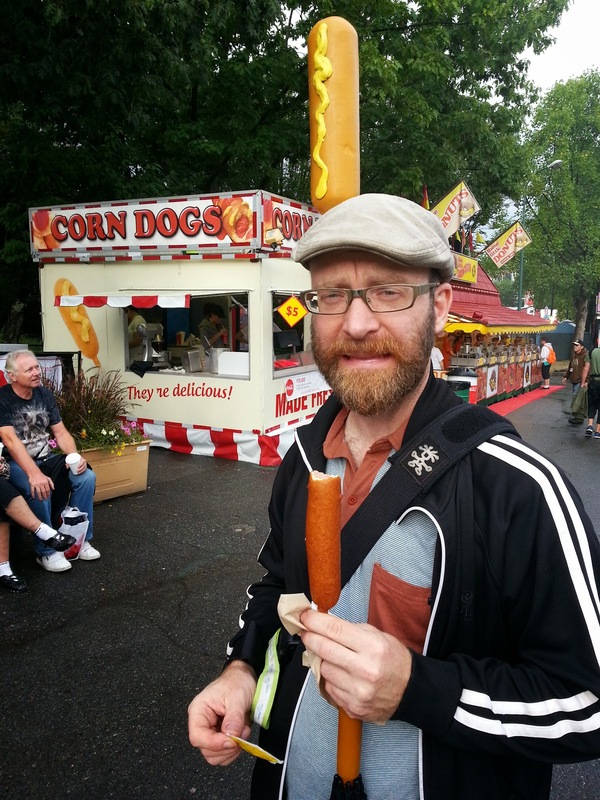 I used to go to the CNE pretty often, where there's an entire food building, and I don't remember the prices being so steep. Though I suppose that could have changed. We're heading down tomorrow, and I'm hoping we can catch Superdogs and the pig races!